Let’s face it, sometimes you just can’t agree on what to eat. If your group wants options, GT’s on the Bay is where you want to be. GT’s is a huge restaurant overlooking Wolf Bay with plenty of seating inside and out. They’ve even decided to bring the bay inside — seriously, they have a giant open-top fish tank with cobia and redfish. The menu is loaded with plenty of Gulf Coast favorites, such as fried crab claws and fresh catch entrees, but it’s the fringe items that sets GT’s apart from the crowd. Jessica, the Assistant General Manager, chatted with us. “We have our big pizza oven that is pretty popular,” she says. “Our Totchos are also a huge favorite. Okay … what the heck are Totchos? Imagine nachos, but with tater tots. 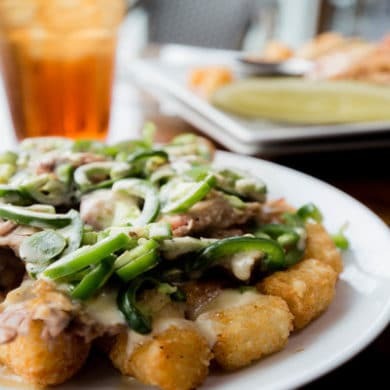 The tots are then smothered with smoked pulled pork, plenty of fresh jalapeños, smoked Gouda cheese sauce and white BBQ. We recommend ordering these as a meal because you won’t want to share. And it’s not just the menu that locals can’t get enough of at GT’s — the view is outstanding! The outdoor deck area is far from just another place to eat. During the warmer months, GT’s has live music every day and plenty of spots to kick back and relax. Don’t hesitate to bring the younger members of your group because GT’s has plenty of games and room to run. GT’s also boasts a full outdoor bar with some killer signature drinks. Try your luck with the Tropic Thunder, a whole pineapple filled with mango, strawberry and coconut rum. If the party hasn’t started, it definitely will after a couple Tropic Thunders. Plan to stay a while at GT’s on the Bay. GT’s is located at 26189 Canal Rd, Orange Beach, AL. For more information, visit the GT’s website or call (251) 980-8400.